I was invited to the White Hag's birthday bash at the weekend and thought it would be rude not head along. 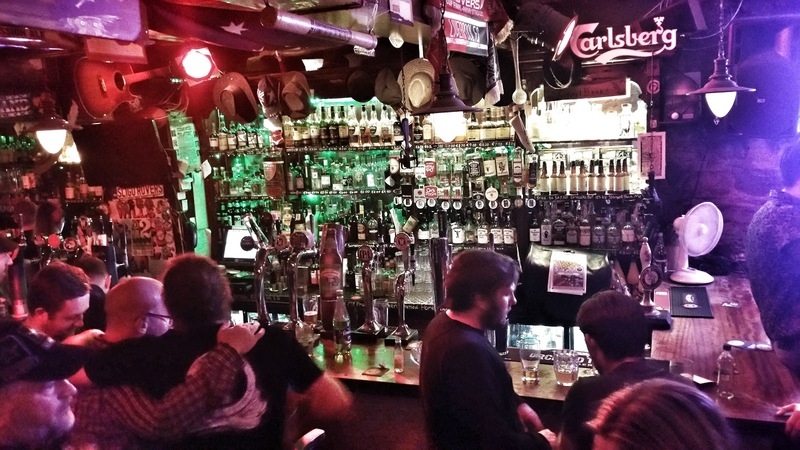 A number of beer writers like myself had the trip kindly comped by the brewery. As they put it, events like this make up their entire marketing budget. That makes sense I suppose because they can never hope to compete with the big boys when it comes to traditional marketing methods like ads on TV and radio. I was asked to be group leader on the early train which basically involved me collecting the group ticket, heading to Brewdock to pick up a case of Little Fawn and getting everyone on board the train. Oh, and then distribute the Little Fawn cans. Not enough to just organise a traditional pissup in a brewery, they decided to invite along a few other breweries and have a small beer festival. I thought that was a smashing idea myself. Kinnegar, Black Donkey, Yellow Belly and Otterbank* where there. It wasn't just Irish breweries either. We had two from the UK with Beavertown and Redchurch also in attendance. After a beer or two, the first group went through for a brewery tour and I was actually taken aback by how small it is. 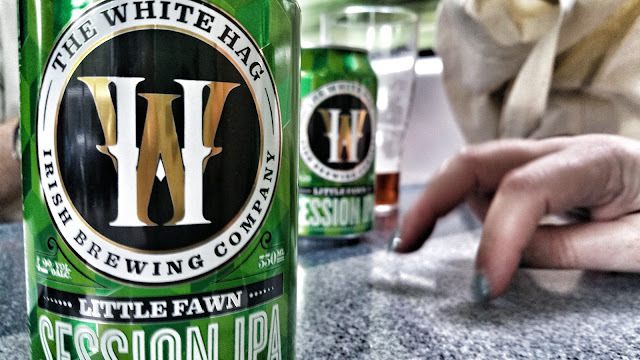 I have been on many brewery tours in my time and yes, quite a few have been very small indeed but The White Hag has such an unmitigated presence in Ireland and still they manage to export about 60% to other countries. To see that the brewery including fermenters was so small was actually very sobering. Well, at least for a few minutes. While the brewery itself is tiny, the building is massive. 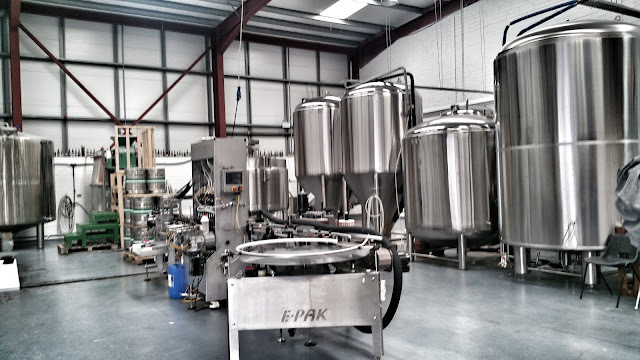 In fact the brewery equipment only takes up about half the space in the smallest section of the building. The rest is for storage and inevitable expansion. 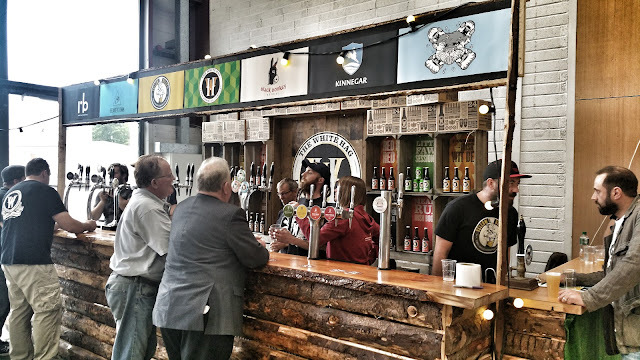 The building itself is an old car showroom with the brewery residing in what was once the repair area. In fact, other than a tiny sign that looks no bigger than an A4 page, the building is still branded as a Subaru dealership. I loved their solution for the barrels that lacked bungs. Just stick a pint glass over the hole and again, they don't have that many barrels compared to many breweries that are barrel ageing. Of course, I was later told that these particular barrels don't have beer, just a storage solution. 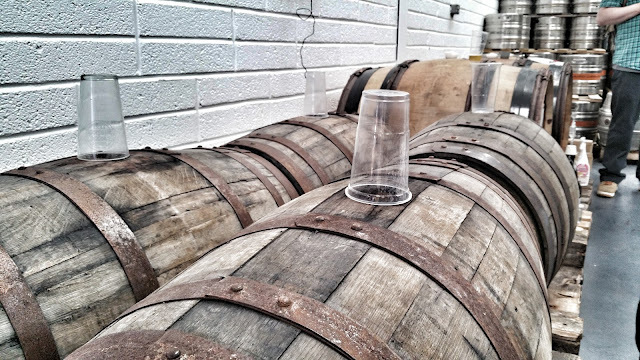 The barrels with bungs contain the actual beer. Joe the brewer took us around the whole brewery and told us what stuff does. Not very interesting unless you have never been on a tour before, at least for me since I have been on so many. It was interesting to get some facts and figures and what I did find interesting was that their kettle is gas fired instead of electric. I hadn't heard of that myself but apparently it's quite common. Joe's reasoning was that you can get a better sustained heat from gas than electric and their heather ale gets a sustained 3 hour boil to concentrate and caramelise the wort. I don't recall fully but as I recall, the kettle loses about 200 litres per hour in evaporation so they lose about 600 litres each time they brew the lovely Beann Gulban. The kettle is 4500 litres. That's the thing about brewery tours. Sure, all of the equipment tends to be the same but then you find out that something is different and it becomes fascinating. Joe is a great storyteller. Joe the brewer spent a lot of time taking photos and video. He likes to do video blogs these days. 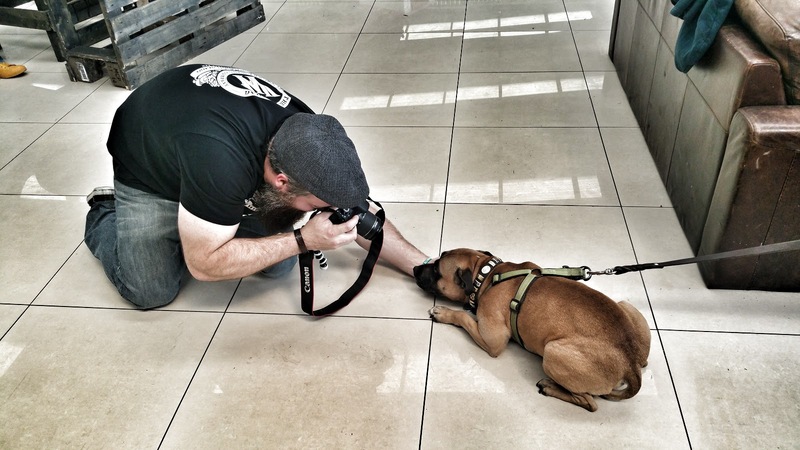 He was particularly enamoured by Sarah Finney's lovely dog Aidan who in turn loved all the attention. He even has his own twitter account. 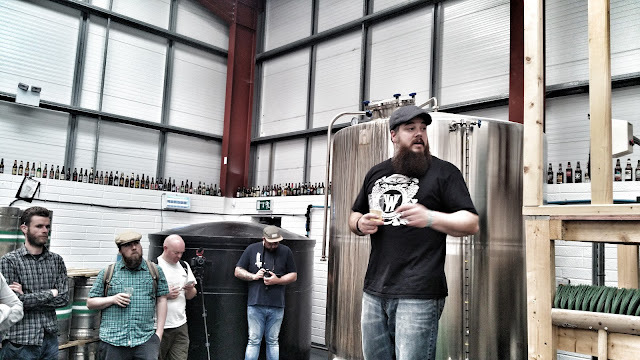 At one point, all the brewers got on stage and Simon Broderick acted as MC while asking questions of the brewers. At this stage, Richard from Black Donkey hadn't arrived. He had just arrived back in the country after an epic motorbike trip around the continent and was racing to Sligo. He stormed in at about the start of question 3. The bar were ignoring his pleas for a beer so I ran up to the bar and got him one. Of all of the fantastic beers that were available on Saturday, one stood out to me. It stood out for being one of the more slightly normal beers available but still very different. 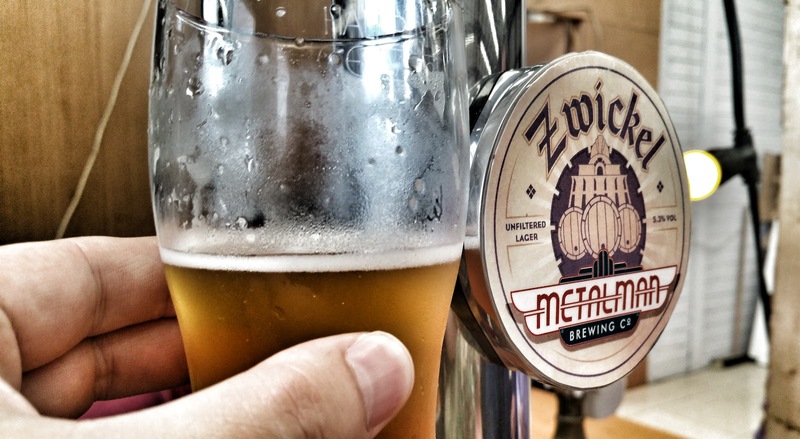 The Zwickel from Metalman was outstanding in every regard. A 5.4% unfiltered lager that ticked all of the boxes for the style. I'll be keeping an eye out for cans of this as I believe it has been released. 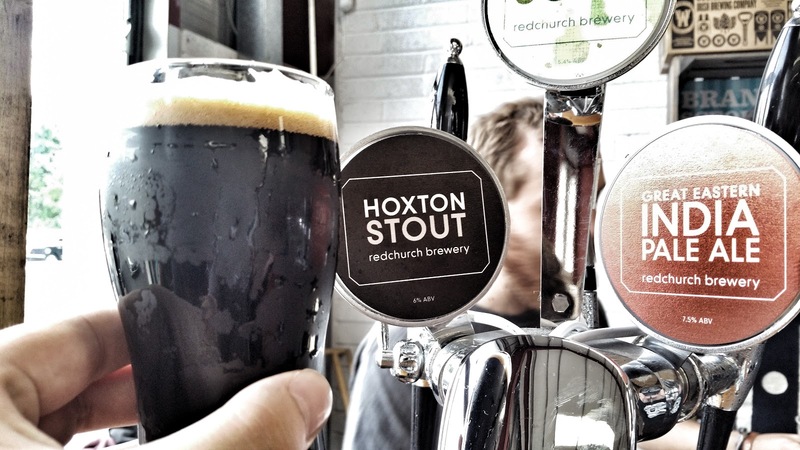 The only new brewery to me was Redchurch from London. Their Hoxton Stout was delicious but I only noticed that it was 6% after I ordered one. Their dry hopped sour was also pretty excellent but I didn't get a change to try the IPA for which I have no excuse because I jumped behind the bar for an hour. Another beer of note was Yellow Belly's The Red Oats Are Commin. Basically an American oat ale. Let's not forget the White Hag beers themselves of course. 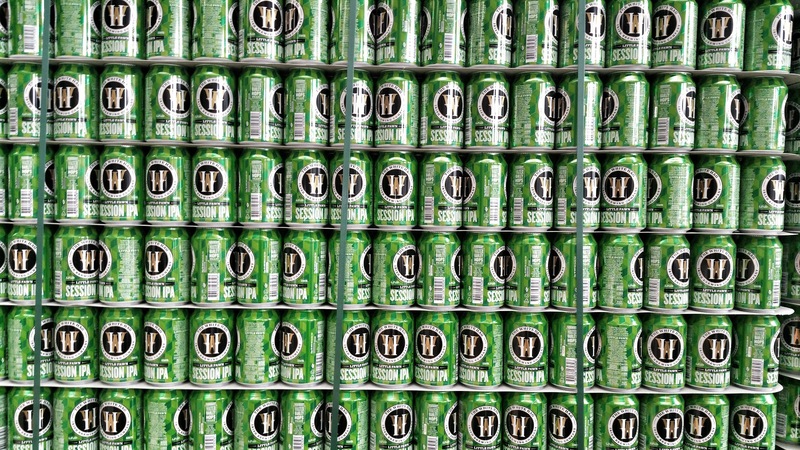 Little Fawn and Puca are two of my favourite Irish beers. All of the beer was fantastic of course but I don't take notes at events like this. For me, it's more about the experience rather than anally taking notes to write blog posts. TheBeerNut was there doing just that so expect a future article on the beers that were new to him. 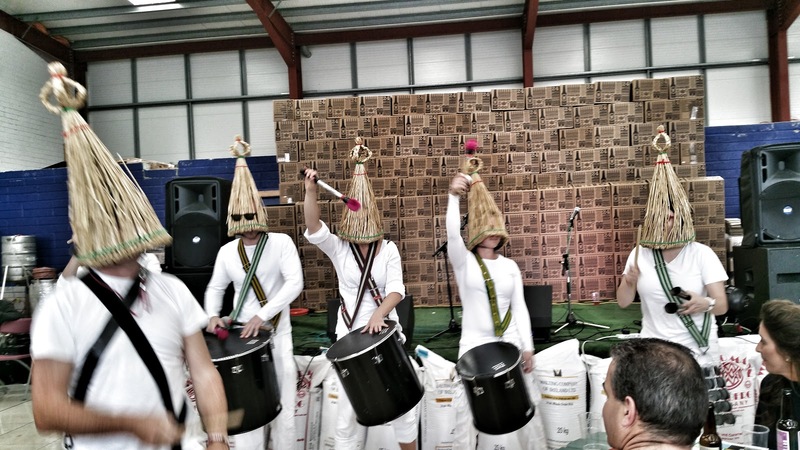 The final piece of entertainment was an odd band of drummers with traffic cone shaped wicker baskets on their head. It must be a Sligo thing. Poor Aidan was pretty freaked out and didn't know whether he should be attacking or cowering in fear. Thankfully, he seems to be a good-natured softie so settled for a deer in headlights kind of pose. There was then an after-party in Sligo town a the brilliant Swagman bar. I had never been there before and I can't fault it. It's like a reverse macro bar. They specialise in craft beer but they have a few token taps of macro for those that just can'd deal with change. If I have one complaint about the whole thing is the lack of cake. A cake came out, it looked interesting but I didn't get any and anyone who knows me will know that I like cake. Simon Broderick has a picture of said cake on his blog post which he somehow had posted the next morning. I suppose that's because he left at a sensible time because he was camping with his family. I'll bet he ate all the cake while he was at it. *Otterbank is Declan Nixon's own contract brand. He's the head brewer at Yellow Belly so it's currently brewed there. No...I didn't get any cake either! Aha, the plot thickens. Who did eat the cake? Was the cake even real?